Everything about this place was amazing! Dimitra and her family welcomed me like one of their own and made me feel right at home. Would highly recommend this place for anyone looking for accommodation in Lefkada! Thanks to friendly and polite hosts, our vacation become incredible. The hotel is close to the center of city of Lefkada. It's very clean. There is parking for the guests. Smestaj je cist,ima sve potrebno. Lako se stize do grada i na glavnom je putu za plaze na zapadnoj obali. Postoji dosta prodavica, pekara i restorana u okolini. Άνετο διαμέρισμα. Υπήρχαν όλα τα απαραίτητα για μια ευχάριστη διαμονή. Το διαμέρισμα και η αυλή ήταν πολύ ωραία και πεντακάθαρο. Βρίσκεται σε κεντρικό σημείο με εύκολη πρόσβαση στην πόλη και στις παραλίες. Πολύ καθαρό δωμάτιο, φιλικοί και εξυπηρετικοί ιδιοκτήτες, πολύ κοντά στο κέντρο της πόλης και σε supermarkets. Das Appartement, die Sauberkeit, die Freundlichkeit des Gastgebers. Sehr empfehlenswert ! Όλα ήταν υπέροχα. Πεντακάθαρος χώρος.Ευχαριστούμε πολύ. La struttura si trova leggermente fuori il centro della citta' di Lefkada ma basta una breve passeggiata per raggiungere il centro. Per chi viene in auto c'e' disponibile in ampio parcheggio riservato per I clienti. Appena arrivati ci hanno subito dato l'appartamento e ci hanno offerto delle birre fresche e chiesto se volevamo dell'acqua per rinfrescarci (veramente molto gentili). L'appartamento era bello, pulito e con in ampio balcone che dava sul giardino dove I bambini possono liberamente giocare. La struttura e' proprio sulla strada che porta verso le spiaggie del versante orientale (Pefkoulia ad esempio). Ribadisco che il personale e' stato molto gentile e disponibile. Ambiente riservato e anche familiare. Lock in a great price for Arodo – rated 9.3 by recent guests! 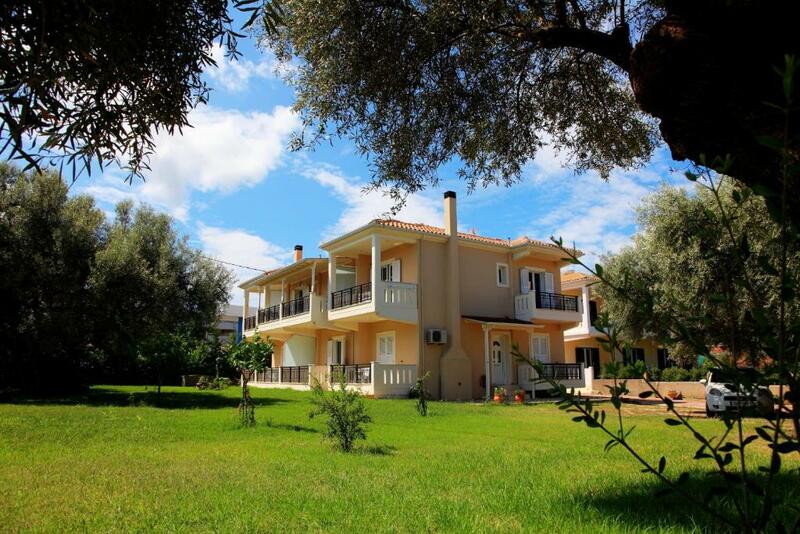 Located at the edge of the town of Lefkada, Arodo offers studios and apartments with a private balcony overlooking the garden. The beaches of Agios Ioannis and Mili are 0.9 mi away. Arodo studios and apartments are air conditioned and enjoy free wired internet access. They come with a kitchen or kitchenette with cooking rings and fridge, and they also include a flat-screen TV. The cosmopolitan village of Nydri is 9.3 mi away and connects to the islands of Meganisi and Ithaki. Within 5 mi, guests can also visit the seaside village of Nikiana. Free private parking can be found near the premises. When would you like to stay at Arodo? Featuring a well-equipped kitchenette and a flat-screen TV, this air-conditioned studio opens out to a balcony overlooking the garden. Offering more space, this air-conditioned apartment includes a well-equipped kitchenette, a flat-screen TV and a private balcony with garden views. Featuring 2 separate bedrooms, this air-conditioned apartment includes a kitchen, flat-screen TV and private balcony overlooking the garden. This family room features a oven, fireplace and kitchenware. This quadruple room consists of 2 rooms and offers garden views. House Rules Arodo takes special requests – add in the next step! One child under 6 years is charged EUR 5 per person per night in an extra bed. Arodo accepts these cards and reserves the right to temporarily hold an amount prior to arrival.